You can get immediate, same day property restoration services if your home or business suffers damage. The technicians at 911 Restoration of East Valley are licensed, bonded, and insured to take care of water damage, fire damage, mold removal, and more. You can contact 911 Restoration of East Valley at any time of day. We are open year-round and we don’t take days off. Our technicians can reach properties throughout Chandler and Gilbert within 45 minutes of a call for help. Once technicians reach your property they can offer a free visual inspection for property owners only. 911 Restoration of East Valley techs are dedicated to ensuring property owners in East Valley get a Fresh Start after any property damage emergency. Contact us now to get the help you need to recover from damage caused by water, fire, sewage backups, and mold. Heavy rains and storms can cause damage to homes and businesses in Gilbert and Chandler. You may also experience water damage if cold winter weather leads to frozen pipes. Appliances may leak, and, in some cases, pipes can even burst in your walls, ceilings, or floors. 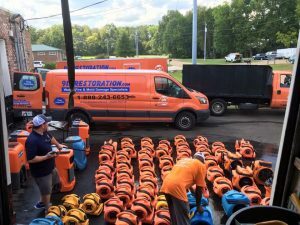 Handling flooding, frozen pipes, and storm damage right away can reduce the over-all costs of property restoration. Ensure you get excellent water damage restoration services by contacting 911 Restoration of Chandler and Gilbert today. Mold can take over your property after a flood, sewage backup, or other situation that leaves you dealing with excess moisture. Mold infestations can damage your home or business while negatively impacting your health. 911 Restoration of East Valley can take care of every portion of the mold removal process if you spot mold growing in your home or business. As mold specialists, we can help you recover from mold damage quickly and effectively. 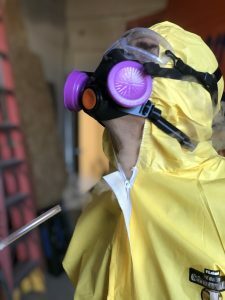 Reach out to the professionals at 911 Restoration of East Valley to get the help you need to return your property to better-than-new condition after a mold infestation. Fires can cause tremendous amounts of damage in a matter of moments. Your home or business may suffer structural damage from the flames. You might end up dealing with issues caused by soot, smoke, and ash. Even the water used to put out the flames can damage your property. Fortunately, 911 Restoration of East Valley has the expertise and equipment to help you completely recover from fire damage. We offer property owners in Chandler and Gilbert free fire damage assessments and free insurance consultations. Property owners who get professional help handling fire damage can reduce the time it takes to completely restore their property. Get ready for your Fresh Start by contacting 911 Restoration of East Valley today for affordable and quality fire damage cleanup. Did you enter your property to discover that you’d experienced a sewage backup? Sewage backups can occur if your pipes get blocked or, in some cases, after very heavy rains. These backups can flood your home or business with raw sewage – or black water – which contains bacteria and other dangerous contaminants. 911 Restoration of East Valley can clean up any sewage backup you are dealing with. You can count on the technicians to bring the professional-grade equipment that you need to completely remove sewage from your property. Our techs understand how important it is to thoroughly disinfect your property after a raw sewage spill. Your health and well-being is important to us, so you should not try to handle to sewage backup on your own. Cleaning up sewage safely requires the use of specialized protective gear used by professional technicians. 911 Restoration of East Valley will not consider the job done until your property is completely restored. Sewage backup cleanup involves removing water, handling repairs, and ensuring that no foul odors remain. Call us now so the techs can help you recover from a sewage backup. Most people aren’t entirely sure how to handle major disasters like fires, floods, earthquakes, and plumbing emergencies. Fortunately, you do not have to try to recover from serious property damage on your own. In the event of a disaster, 911 Restoration of East Valley can even pack-out and store your possessions to protect them from taking any damage. The staff cares about the communities around Chandler and Gilbert. It’s our goal to provide total restoration services after any natural or man-made disaster. You can get the help you need to recover from a property disaster by contacting us right now for same day services. Let us begin repairing and restoring your property so you can get your life back on track in a better-than-new home or business.